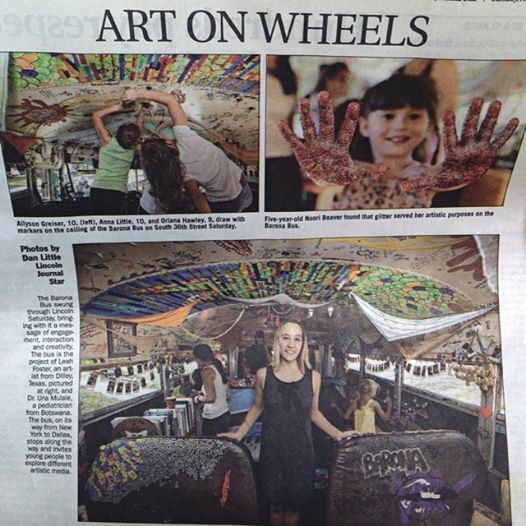 Leah Foster (MFA AP14) and Una Mulale’s Barona Bus project’s stop in Lincoln, Nebraska was featured in The Lincoln Journal Star. 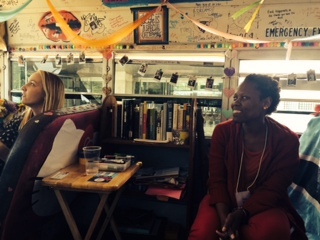 Leah Foster’s (MFA AP14) Barona Bus was parked at the Queens Museum Open Engagement Conference this past weekend. You can read an interview with Leah about the project here. This Friday, Leah Foster (MFA AP14) and her collaborator, Dr. Unami Mulale, will park the Barona Bus, a traveling container for social engagement and conversations about healthcare, at the Open Engagement conference in Queens after two months on the road hosting events across the country. The bus is just one part of a larger collaboration between Leah and Una through which they hope to build the first pediatric hospital in Botswana,a hospital in which art is valued alongside medicine as vital to well-being. In anticipation of their presentation of the bus this weekend, Leah spoke with AP staff member Allison Hewitt Ward about her transdisciplinary practice, the shifting terrain of artist and viewer and creating spaces of shared ownership and concern. AHW: Can you tell me about the Barona Bus and the stops you made between Dallas and New York City? LF: We planned events in different cities with contacts we had before the project began. We hosted dinner parties and went to a high school, a couple universities and a community college. Each event was different because it was conceived specifically for that place and the individual hosting us. We also stopped at a couple community events, including Rick Lowe’s community project Trans.Lation:Vickery Meadow, in Dallas. When we park the bus we invite people to come in and to create whatever they want. We have all kinds of art supplies, but what’s more important than the way it wound up looking was the fact that the bus was a container for engagement. It’s an archive of human interaction and human existence. When people set foot in the bus, both adults and children, they write their name or draw a smiley face or paint a beautiful picture. Whatever it is that they’re doing, they’re saying “this is me, I’m leaving my mark.” That was the idea going into it, but at the start we didn’t know what was actually going to happen. People could just say “screw this.” I had expected there to be provocateurs, people who wanted to antagonize the space, but there wasn’t much of that. People have been very respectful of other visitors’ marks. When they entered the bus they looked around and saw all the names, quotes and drawings that people had made in the space and understood that they were contributing to the bus as well. My hope was that it would become layered, that things would be covered up and painted over and the bus would be filled up with layers and layers of history and of all the people that had come in, but they haven’t been covered up, nobody has been writing over other things. AHW: That’s interesting. At the recent Paweł Althamer show at the New Museum there was an entire floor set up with paint supplies that guests could use to make marks on the walls, floor, anything, and even on the opening night people were painting on top of other’s marks. LF: That’s exactly what I thought would happen. I did a similar project a long time ago in a gallery space and that’s how it played out there. But not in Barona Bus. Everybody who set foot in the bus was very careful. AHW: Why do you think that was? Do you think you fostered a unique space of mutual respect? LF: I think so. It may have been because we talked to people before they came into the space. It wasn’t just a free-for-all tag this bus kind of thing. There was context given. AHW: What was the context that you gave? LF: Una and I explained that the bus was part of a much larger project: we’re trying to build a children’s hospital in Botswana and we’re working on merging art and medicine in order to better address the physical, emotional and psychosocial aspects of health. We take into consideration music therapy, art therapy, animal therapy, and other so-called alternative treatments that produce positive results. We talked about that. Perhaps that context paved the way for the kind of care that people gave to the bus. No one destroyed anything. But at the same time, if they do destroy something, that’s part of the project and part of the conversation. There’s a big painting that an artist in Dallas did on one of the seats. Later, a child came in and wrote a little smiley face on it. Each of their marks is an acknowledgement of their existence. Both are equal in my eyes. AHW: Unlike political campaigns or activist projects that tend to work towards a set goal, Barona Bus is an open-ended effort that emphasizes process over results. Are you making a claim for a socio-aesthetic alternative to existing models? LF: I call it cupcake politics. It’s kind of a Trojan horse technique that I learned from Felix Gonzalez-Torres. I think that you can fight for people through love and I think that rather than run around with my picket sign and a megaphone yelling at people about my political agenda—there is one—I can wrap up my political statement in a cupcake and give it to you with a smile. That’s my approach to the bus. It comes from a place of genuine care and concern, but it’s not just the free-for-all that it appears to be. There’s political content within it specifically related to our larger collaboration together. I see it as different from some “socially engaged” work. The political statements are there, but they’re not at the forefront. AHW: You draw a distinction between your work and relational aesthetics. How do you see those distinctions between the type of practice championed by Bourriaud and your project? LF: I think that relational aesthetics—while I appreciate its emphasis on human connection and engagement between people—is problematic so long as it operates under the umbrella of institutional capture. Rirkrit Tiravanija has served a meal in a gallery space, but I serve meals in a school bus that just pops up wherever people happen to be living their lives. We’ll eat dinner there. It’s an experience that takes place within the context of the day-to-day, not separated from it in a perfectly white space. That’s a distinguishing factor. AHW: Some artworks in that vein become too immured or enclosed in an arts context. It seems to me like Barona Bus is not so much enclosed as bracketed or annotated by that context: you began at the Dallas Art Fair and you’re pausing now at the Open Engagement conference, but it seems like everything in between took place in a much broader cultural space. LF: Duchamp took a urinal, put it on a pedestal upside down and called it a fountain. Then Tiravanija said that he wanted to take Duchamps’s urinal, put it back on the wall and piss in it, and that’s what he did, within the context of the museum and the gallery. Tania Bruguera took that concept further by saying that she wanted to put Duchamp’s urinal back in the bathroom. But for me there’s still an overemphasis of Duchamp’s urinal. I want to take any urinal anywhere and use it as a urinal. That’s what I’m moving towards. AHW: I think that in the situation you just described, fully integrating art into the praxis of life without an institutional framework, the idea of the artist is complicated or called into question. It becomes almost a double negative. LF: Yes! Double ontology! The theorist Stephen Wright talks about that. He discusses the idea of a double ontology: an artwork is both what it is and the artistic proposition of what it is. I’ve understood it that way for some time, but until I found Wright’s work I had never found it articulated. Wright proposes that, rather than a specific skill set, the artist has artistic competence. I think of that as the lenses through which I view the world. If I’m trained as a doctor, as an artist, anything that you spend a long time at work on, I come to see the world through a certain kind of filter. For example, after spending a lot of time with Una, a doctor, I notice peoples’ veins, which is something I’d never noticed before. I’m coming to see the world through her lenses. As an artist I think there’s a certain way that I view the world—not inherently, but because of my work and education. AHW: Can you give an example of that? LF: I think it’s a different experience for everyone, and not only do I wear the lenses of an artists, I wear the lenses of a woman from Texas, a woman who lives in New York City, an individual who’s engaged in the nonprofit world. For me, at least in my collaboration with Una, I think the lenses that I provide and that she is now able to put on through me give her permission for some of her ideas. She’s a doctor, and there’s a specific knowledge and set of acceptable approaches that she’s been trained in, but she has all these crazy ideas—which make perfect sense to me—about how she wants to treat patients and how she thinks medicine should be performed. I think that our collaboration gives her permission to say that these ideas are ok. We exchange perspectives in our partnership. AHW: Art and medicine have a long history of exchange in the form of anatomical drawings, models and photographs. These visual representations have been crucial to understanding, diagnoses and treatment of disease, but you and Una link art and medicine on the terrain of wellness. How do you forge that link? LF: Historically art has been considered a subordinate aid to medicine. Most hospitals treat art as an accessory to the medical treatment. That’s not how we want to do things. Una and I think that both can be equal. There’s a lot of things that might not necessarily require a pill. Contemporary medicine tends to treat the disease, not the person. If I’m a child who had experienced severe trauma and is exhibiting symptoms of ADHD, most contemporary practices would just give me a pill for the ADHD and ignore the other factors. It doesn’t have to be that way. The art aspect will address the trauma. In the hospital that we eventually hope to create my role will not be that of an art therapist. I’m not an art therapist, I’m an artist. My role would be to seek out and engage those kinds of professionals and to create a space where there are resident doctors and resident artists working together side by side. AHW: Do you see yourself as a permissive imagination for the project, the person to open the doors to unconventional practices? LF: Yes, absolutely. I also see myself in some ways as a curator and a gardener. Una and I plan to start building the hospital by planting a central garden. I want to live in the garden and raise the animals. AHW: We’ve talked about a shifting understanding of the artist. What about the viewer? How do you situate the changes to that category and perhaps its eventual evaporation? LF: I like that idea of evaporation. For me the word viewer is problematic. I read so many artists statements that say “the viewer does A, B and C,” or “the viewer contemplates…”, “the participant engages…”. People are different, they bring they’re own unique set of experiences to what they’re looking at or engaging with. This idea of the viewer or the participant conceals and undermines that. Thinking about the evaporation of that category, Wright points out that an artist’s disappearance into the world challenges the ideas of authorship, spectatorship and spectacle. If the spectacle disappears and there’s nothing to look at there can be no spectator. It can be problematic, but it’s exciting to think about because in that situation art is everywhere. Art is all around you and it’s not something that you have to look at or experience because it’s directly integrated into everyday life. AHW: I think there was a strange turn in high modernism, minimalism in particular. Minimalist artworks and theories acknowledged the viewing body in the room as part of the aesthetic situation, but in doing so formulated a monolithic category of the viewer or the body. We as viewing, moving, observing bodies were all recognized for the first time, but at the same time we got sold out. LF: Barona Bus has been gradually getting closer to real life, but it’s still institutionally inscribed as “art”. The art of modernity and postmodernity has been inscribed in and by the institution. It aesthetically appropriates these ideas of the body or the person to create that monolith. The viewer becomes a stand-in for people living their lives. AHW: How do you define transdisciplinary and what role does it play in your practice? LF: Transdisciplinary, as opposed to interdisciplinary or multidisciplinary, is a matter of transcending the idea of the discipline. Inter- is more a matter of different disciplines connecting to each other. Trans- goes beyond that. Within a transdisciplibary practice, you could have not only an artist and a doctor working together, but you’d also have a mother of a sick child working with them, a social planner, a politician, whoever. It’s not all necessarily discipline knowledge. There’s no assumption that only people from certain disciplines have something to bring to the table. Every human being does. The knowledge of a mother with a sick child goes beyond Una the professional doctor and me the professional artist. That’s knowledge that we don’t have and won’t ever have unless we have a sick child. That’s valuable knowledge. That’s one of the biggest differences. It includes something we might call undisciplined, although I’m wary of drawing a firm line between discipline and non-discipline. AHW: The transdisciplinary respects all kinds of knowledge? LF: Yes, but it goes further. It’s not only concerned with what each individual brings to the table The transdisciplinary engages the spaces between, within and around disciplines. It’s a much more encompassing way of working. AHW: You archived the Barona Bus in two ways: both the actual bus as an archive of itself and a blog. What becomes of those things now? Are they documents of the project? Are they works of art? LF: This is what I’m still resolving. I find the experience itself and the relationships between individuals to be the most important thing. The documentation is always so fragmented. The bus was a way to handle my discomfort with documentation. The bus itself is an archive of everything that happened in the bus. The blog, on the other hand, was the documentation of the documentation. It’s a way to communicate with people who aren’t there, to keep it all connected. I’m not sure what happens with that. It’s not over yet. I still have to get the bus back to Texas, so there will be a second tour. A lot of the people that I met along the way want to do bigger events. AHW: Is it primarily an arts community coming to the events? LF: Some yes, some no. It was a mix. AHW: That’s great. I think that’s the dream of a lot of social practice. AHW: How do you feel your work has changed over the course of your MFA? LF: I came into the program as the cupcake girl (I was doing all kinds of work involving cupcakes). That’s still with me—I just referenced cupcake politics. The difference is that now I know how to relate my politics to the cupcakes. I’m also much-less object oriented, and even less process-based. I’m not making discreet objects, per se. I was given the space to figure out the collaboration with Una. She and I knew each other and she eventually told me about her idea to build a pediatric hospital in Botswana and I told her I wanted to be a part of it. She went on this whole rant: “all these Americans think they can go to Africa and save Africa, so if you want to help, you need to go to Africa.” She was trying to scare me away from it, but I said, “cool, I want to go with you,” and I invited myself along to go home to Botswana with her to visit her family. It grew from there. We then went to the Creative Time summit together. That was her first introduction to the art world that I live in. That cemented our collaboration. Before then we didn’t really have a word for it. I had been working on my Art Practice thesis and my bus project which, at that point, was not the Barona Bus, it was separate from my work with Una. At that point I decided to connect all of it. We had been saying “I am you and you are me. We are different and we are the same.” but I wasn’t fully living that idea of intersectionality until after I integrated it all. I don’t want to create Leah Foster the artist that’s disconnected from our work together. I don’t want Una to be an accessory to my practice and I don’t want to be an accessory to hers. AHW: I really like your use of that word, barona, a Setswana word that roughly translates to ours in English. LF: Setswana is the language spoken in Botswana. It means ours, but not the same way yours/mine/ours works in English. In Botswana when you say barona it’s very unifying. It’s an encompassing ours: we are together in this. If Una says to a parent “ke bana barona,“ she’s saying “your child is my child.” There’s an understanding that she will treat the child as if the child was her own. That’s our approach to the Barona Bus. AHW: Do you ever think about that in terms of ownership and commodity form? LF: I’m driving this big bus around the country that says ours. Most people don’t know what that means before they step onto the bus. As soon as they come in, they ask. There’s an idea that they’re stepping into a bus called “our bus”. They have total ownership of it. AHW: Do you suspect that influences the respect for the space and for the marks in it that we talked about at the beginning of our conversation? LF: I think so. Yeah, I hadn’t made that connection yet. As soon as they come in and find out that it’s ours, barona, they take ownership, there’s a mutual respect. Leah Foster (MFA AP14) will be presenting her thesis project, the Barona Bus project, a collaboration with Dr. Unami Mulale, at the Open Engagement Conference at the Queen Museum, May 16-18. The conference is free, but you must register to attend.